Whether it’s a regular chat with friends or any other communication, people often feel that a message is incomplete without an emoji to punctuate it. Emoticons or emojis over the years have wriggled their way and become an integral part of day-to-day conversations. Emojis present an opportunity to connect with consumers in a fun, relatable and creative way. Memoji - Apple announced that Animoji is getting updated with tongue detection, new characters, and the ability to create a custom Animoji that looks like you, called Memoji. Now, where you would normally select Animoji, swipe right and click on the add button to create a custom Memoji. Here you can build a virtual version of you from the ground up, picking things like freckles, skin color, hairstyle, and accessories like glasses and earrings. It can then be saved to use within messages like a regular Animoji, or even overlaid on your own face when taking a selfie for a fun real-world / cartoon hybrid version of yourself. Facemoji - Facemoji Emoji Keyboard Lite is the First Emoji-Centric Android keyboard app. With 1200+ Emoji, emoticons, GIFs, stickers on this Emoji keyboard, Facemoji helps you to spice up chat in Facebook, Twitter, Instagram, Messenger, WhatsApp. The faster hands-free typing of Voice Input allows speech to text dictation and boost your input speed whether you’re texting messages or writing notes or composing an email. 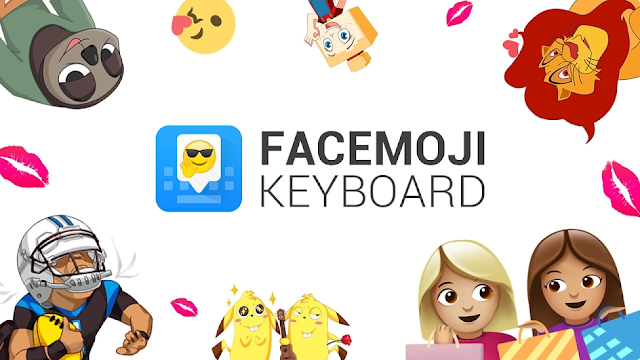 Facemoji Emoji Keyboard Lite provides thousands of cool keyboard themes for you to download. Or you can choose your own photo to make personal photo keyboard. AR Emoji - Utterly unique and completely customizable, AR Emojis allow Galaxy S9 and S9+ users to inject emotion into messages in a way that words simply can’t. Now, Samsung has made it even easier for users to express their inner selves by doubling the number of animated stickers that are automatically generated whenever an AR Emoji is created. The smartphones’ camera app update, now available in the ‘My apps’ section of the Galaxy Apps store, has expanded AR Emoji’s library of pre-set expressions from 18 to 36. Samsung also plans to add 18 more expressions in the coming months, which will bring the feature’s total number of emotion-capturing sticker options to 54. Bobble Keyboard - Bobble is a 3rd party keyboard for visual and personalized communication on Android and iPhones. It has 15 million installs. It is the highest-rated (4.6) Android app in India at its scale, across all app categories. It is the #1 keyboard from India, and is among top 100 engaged apps on Google Play globally. It has partnered with OEMs and products including Apple, Foxconn, Gionee, LAVA, Zen, Indus OS etc. It has worked to promote major brands including Tinder, Zomato, YourStory, media houses like Eros Now, and numerous IPL teams.